Wicked Plants | What's On My Nightstand? 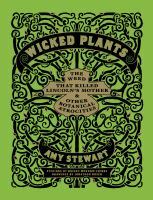 Amy Stewart’s entertaining and informative book Wicked Plants: The Weed That Killed Lincoln’s Mother & Other Botanical Atrocities did indeed spend some time on what passes for a nightstand in my bedroom. Exquisite etchings and – to be frank – grotesque illustrations accompany brief chapters about the destructive, disgusting, and sometimes illegal qualities of disagreeable plants throughout the world. Readers will discover intriguing sections revealing the roles of various plants in warfare, witchcraft hysteria, agricultural blunders, historic events, untimely deaths, and, naturally, thoroughly grossing people out. Before you turn out the lights you can brush up on your knowledge about a variety of botanical ne’er-do-wells. Poison Hemlock, known in Scotland as “dead man’s oatmeal,” was used to carry out the death sentence of Socrates in 399 BC. Severe niacin deficiency, known in its late stages as pellagra, was the baffling downside to wider consumption of corn in 18th century European populations whose method of food preparation did not enable the absorption of this important vitamin. The role of white snakeroot in causing milk sickness, the ailment that claimed the life of Abraham Lincoln’s mother in 1818, was poorly understood for many years until farmers finally learned to keep it away from their grazing cattle. Illinois doctor Anna Bixby identified the correlation between the plant and the disease, successfully helping to eradicate the disease from her area by 1834. Sadly, the warnings of this notable female doctor went unheeded elsewhere.